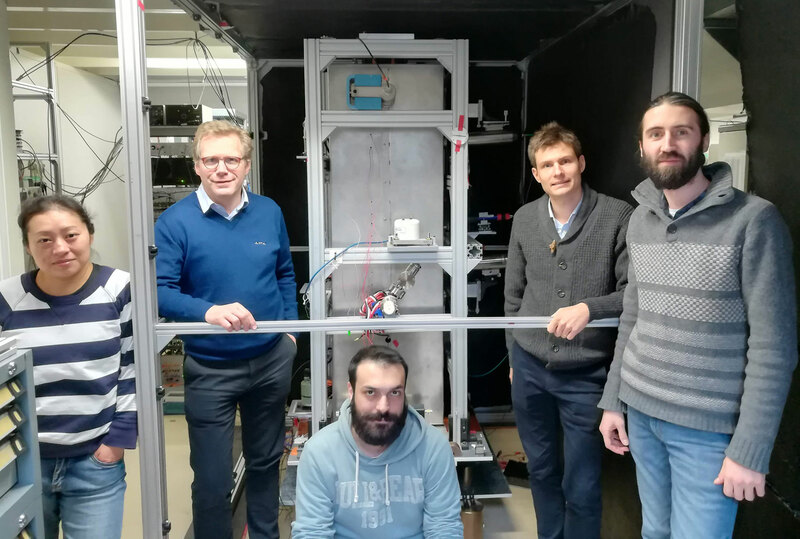 A team of scientists at the time-space reference systems laboratory of the Paris Observatory is improving the efficiency of cold atomic detectors via a method which increases their measurement rate and thereby increases their sensitivity. Cold atom detectors, such as clocks or gravimeters, owe their great sensitivity to the possibility of observing atoms for times on the order of a second. Nevertheless, none of these systems is able to sample signals which vary for times shorter than a second. Although they are very stable, the cold atomic systems do have an important drawback: their rate of measurement is limited. This drawback is a consequence of the sequential functioning of the detectors, in which the atoms are cooled by lasers for several hundreds of milliseconds, to be subsesquently "interogated" for about a second after which is initiated a fresh cycle of measurements. Until now, the measurement rate could only be increased by reducing the duration of the interrogation, and hence reducing the sensitivity. From left to right: Bess Fang, Arnaud Landragin, Matteo Altorio, Remi Geiger, Leonid Sidorenkov. This limitation has been bypassed by a team of scientists at the Time-Space Reference Systems Laboratory (Paris Observatory, PSL University, CNRS, Sorbonne University, Laboratoire National d’Essai). To do this, the scientists exploited the idea of combining the cooling phase and the measurement phase of the inertial effects, and to combine many TT experimental cycles. By combining 3 cycles, the team achieved measurement rates of 3,75 Hz even while keeping the interrogation time down to 0,8 second. The rapid sampling obtained through this technique led to an increase in the sensitivity of the measurement of the rotational velocity of their device, which was an essential prerequisite to characterize and stabilize the biases of the instrument. Left hand side: sketch showing the principle of the sequential measurement method, in which clouds of cold atoms (blue, green and red balls) are injected and move in parallel in an atomic interferometer (dotted lines) created with the help of laser pulses (grey beams). The first pulse creates the quantum superposition which corresponds to the two paths taken by the atomic waves, which are then combined at the level of the second pulsed laser. When the device is made to rotate, an atomic interference signal is observ ed. Right had side: determination of a velocity of rotation which has a sinusoidal time variation. The x-axis scale is 200 nanoradians per second per division. The SYRTE experimental set-up uses laser pulses to create a quantum superpositionign which each Cesium atom is delocalized between two wave packets separated by several millimeters. Such a macroscopic quantum superposition gives a great sensitivity to the inertial forces whose combination turns out to be very profitable. The SYRTE gyrometer thus enables one to measure variations on rotational velocities, variations which are two hundred thousand times smaller than the mean rotational velocity of the Earth, and this during 8 hours of measurement, which thus constitutes a new record for atomic gyrometry. These results, published in the journal Science Advances, could lead to new applications in technology and science. The great measurement stability of the cold atom gyrometer opens the road to improvements in inertial guidance devices, by combining the current technology of gyrometers which have a large measurement dynamics, with atomic technology. In the case of the geosciences, the ability to have a high measurement rate (many Hz) coupled to a high sensitivity could be profitably applied in seismology to study tectonic motions. In fundamental physics, these properties could also be used to detect dark matter, or to detect gravitational waves using atomic interferometry.